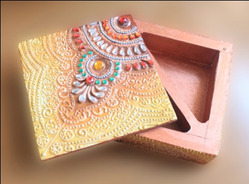 With rich industry experience and knowledge, we are manufacturing, trading and supplying a wide assortment of Wooden Jewelry Box / Dry Fruit Box. 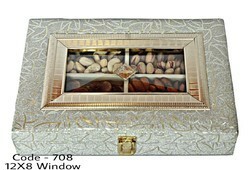 Multipurpose box can be used to keep dry fruits, toffees, etc. Also can be used for pooja etc. It is handmade and very beautifully embellished. Our range of products include acrylic gift box, acrylic elephant suggestion box, acrylic cufflin holder, acrylic butterfly specs holder, acrylic bottle holder and acrylic hot blower display stand. Keeping the diverse requirements of customers in mind, we are instrumental in providing Acrylic Gift Box. With thorough industrial knowledge we are involved in granting a wide range of Acrylic Gift Box. Offered products are widely used for gifting are highly appreciated among our clients due to their aesthetic designs. These are specially designed using advanced methodologies to meet all the needs of our international patrons.